Price Includes: Accommodations, roundtrip airport transfers, kayaking, shore diving. Dive packages available as are meal plans. Beqa Lagoon Resort offers 25 deluxe, private air-conditioned Bures (mini-suites) spread out beneath the lush tropical landscape. Each of these generously sized mini-suites are beautifully appointed with traditional island décor. 12 stunning beachfront bures grace the shoreline, each with their own private courtyard, large sundeck and cool plunge pool. One of the beachfront bures is designated as our honeymoon bure featuring premium ocean view, upgraded contemporary interior and a romantic outdoor shower. 6 charming bures surround our koi pond and 3 very private bures are tucked away in the garden. For families or groups we suggest one of the 4 comfortable and spacious two-bedroom bures. Each of these are about 1,000 square feet with 2 private bedrooms and a large living and dining room area. Enjoy soothing ocean views from your private patio or balcony. Beqa Lagoon is primarily a diver’s paradise, although other activities can be found both at the resort and nearby. Join a volleyball game with locals, hike to the mystical waterfalls, or swim, snorkel, or kayak from the resort’s beach. Other activities can be arranged by resort staff at an additional cost, such as deep sea fishing, surfing, waterskiing, rafting, or tubing. 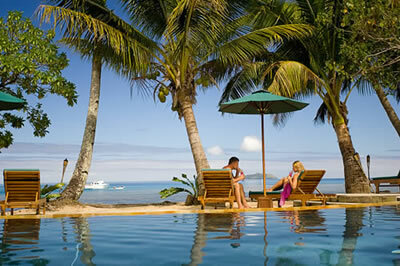 In addition, Beqa Lagoon Resort offers nightly entertainment at the bar, and a weekly traditional Fijian performance, meke, through which Fijians express themselves and narrate stories of their life. Meals are served in the casual elegance of the spacious open air Bure Kalou. Chef Laniana “LaLa” prepares a wide variety of dishes that amaze even the most experienced gourmet. Enjoy fine dining with a magnificent range of taste sensations including fresh local fish, vegetables and fruit, New Zealand lamb, Australian beef and incredible desserts. There are plenty of choices to quench your thirst – imported wines, Fijian beer, fresh squeezed juice and refreshing spring water.